Featuring Awesomely Artistic by Stampin' Up! This month it's watercoloring and pre-embossing. 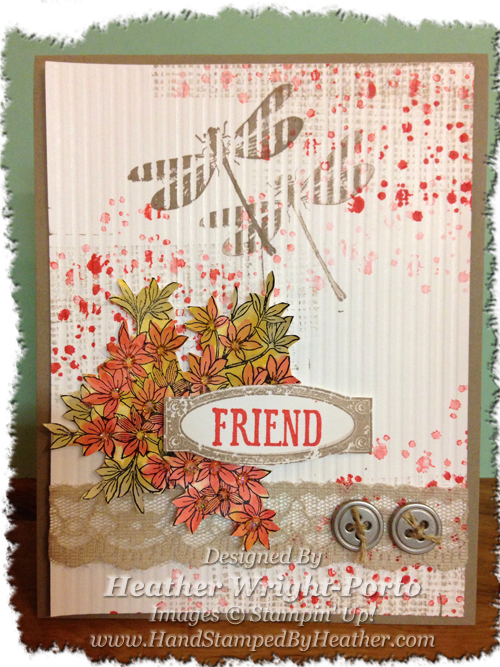 You'll see many ladies used the Color Me Irresistible paper from Stampin' Up! (which I have to get!!!! ), but I instead manually embossed my card using Simply Scored and made vertical scored lines which then has the appearance of what a Textured Impressions (embossing folder) may do. Check out the dragonflies! You can definitely see the scored lines. How did I make this card? First I took a piece of 4" x 5.25" piece of Whisper White cardstock and used the Simply Scored tool to fake-emboss the card with vertical lines every 1/8 inch. What do you think? Next, I stamped the horizontal patterned stamp in Tip Top Taupe. Why does it look so light? Because I also used another stamping technique called Stamp Off (where you stamp on a piece of scrap/grid paper once or twice first, then you stamp on your card, giving you a lighter shade). I did that on the bottom right, middle left, upper right. Next, I used Watermelon Wonder with the dotted stamp, and again, here you can more clearly see the effect of the Stamp Off techniques. It looks like I used a few different pinks, but it's really just Watermelon Wonder and me stamping a few times before re-inking the stamp. Then I stamped the dragonflies with Tip Top Taupe. Then wrapped ribbon around the card front, added some buttons and linen thread. Adhere to card base (Tip Top Taupe). Last but not least...the Watercoloring technique..and the flowers from Awesomely Artistic stamp set. Typically it is much better and recommended to use a bigger stamp, such as a single flower, however I just wanted to stay with one stamp set for this project. Watercoloring with an Aqua Painter can be tricky, so be sure to stamp your image in StazOn Jet Black ink. Then allow to dry quickly. Then, with the ink pad closed, squeeze the top to the ink pad (which then gets ink on the cover, top, when you open the ink pad for use). Then use the Aqua Painter with that pooled ink and cover your image with the lighted color used. And the use the same procedure with the medium or darker inks. When complete, cut out image and adhere using Stampin' Dimensions. Then, stamp, cut or punch a greeting/message and adhere using Stampin' Dimensionals. Then added Dazzling Diamonds to the center of the flowers for a little glitz! In my next posts you'll see a cool tool, MyStampingBlog, to list all the products used to make this card...but...for now I will list them here. Click on each of their names to visit their blogs, or simply click the “next blog” button below that to move on to Sandi's blog. Wow Heather, your card is fantastic ! Very pretty! Love the way that your flowers turned out, great background too! Thanks ladies!!! It really means a lot as I have been out of it for so long...it's so nice to come back --- thank you so much for your support :D I'm off now to go thru the hop :D Happy Friday! It appears stamping is like riding a bicycle - once learned it remains. Beautiful card and I love the muted colors. Looking forward to seeing more. Heather, I love your card! I like how you made your own ribbed paper with the simply scored board. Love that stamp set, you did a beautiful job! Can't tell you have not been crafting for a while, your card is nothing short of stunning, love everything about it. Wow!!! beautiful card....I had picked up this set as well.....You do pretty things Heather. Hugs from Shelagh.